Tossing It Out Tossing It Out: #IWSG: What's a Writer To Do About a Bad Review? The first Wednesday of the month means that it's time for the event that probably needs no introduction, but just in case this particular post goes viral I'll tell new readers what's going on. 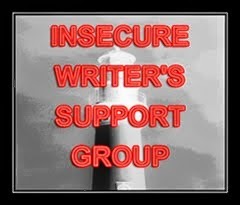 Today's post is my offering to the Insecure Writer's Support Group where writers from many blog quarters provide mutual support for those who may be getting hindered in their writing lives by insecurities that accompany the profession or may just be a part of life period. Started by Alex J. Cavanaugh, the IWSG is there for you if you need us--and who doesn't need a shoulder to lean on now and then? If you want to join then sign up at IWSG. How should I respond to someone who gives my book a negative review because they didn't understand what I was saying or doesn't agree with me? Actually nobody has asked me this but I did answer this question for a writer I was trying to help. This writer had put up a short e-book at Amazon and during a Free promotion I decided to help him out by promoting his book on my blog. While it was free I downloaded it so I could leave a review because as I'm sure most of us will agree, reviews are very helpful to have for your product. To summarize for those who chose not to look at the Amazon listing, I gave what I thought was a very positive leaning four star review with an advisory that the story had a Christian bent to it. My review was geared to assist potential purchasers in deciding if they would want to buy the book. I described the book as it came across to me and gave my honest opinion about the book. In turn the author, not realizing who had left the review (since he knows me by my real name), responded to me at some length in the comment section below the review. I think he came across as very defensive if not a bit reprimanding in response to the review I had left. In his response he explained points that he thought I missed or just did not get. He was civil in his response, but I felt it was not a wise decision on his part to do such a thing. To help educate him, I chastised him for having engaged with a reviewer and arguing the points of the review with his refutations. I told him that this made him look unprofessional as an author and that if he argued his side with every reviewer who left a slightly bad review he could have quite an extensive battle ahead of him if he did get many reviews. My response to him was polite, but I did let him know that in the future he needs to let the reviewers have their say without his intervention unless they were specifically asking him to say something. After that he did leave a word of thanks for my advice, but I thought he basically ran off with his tail between his legs at the end of our interchange. If an author is insecure about what readers are saying I don't think it's the author's place to fight with his critics. That author should accept what has been said whether it be good or bad in the spirit of education so the advice can be considered and applied to future writing. Not everybody is likely to like everything we write. People have different tastes and different opinions and the author needs to realize that. It is arrogant to believe that what you have written is irrefutable and beyond judgement by those you read your work. Do you think the author to whom I've referred was okay in trying to set his critic straight? Did I give helpful advice to the author or should I have just let it go? If you received a review that you did not agree with and it perturbed you, would you argue with a reviewer about it? Do you feel that negative reviews are discouraging or do they encourage you to be a better writer? Once you said he'd responded, I had to go look! Bad reviews and average reviews happen. We have to live with them. The moment we start engaging and debating a review, we've lost. Especially on a place like Amazon. Or Goodreads. A comment like yours would be really valuable though. It's in depth, telling the author he did right and what he needs to work on. It's a good mix. There was just some big hubbub on Goodreads about this very thing. Things got nasty between authors and reviewers and as a result, Goodreads even changed their review policy. I think that authors should NEVER respond to reviews. Never! Good or bad. It's just creepy. No reader likes to think of the author hovering around like Big Brother. No thanks! Also, the last thing authors want is to discourage people from leaving reviews. Good or bad, we need them. You can't control how people are going to respond to your work and trying refute a review is pointless, exhausting, and can make people not want to read your future books. I'm still torn about if I'm going to read my reviews or not. But I would NEVER respond to a review. Good or bad. As a reader, I write reviews for the readers' benefit, not the author's. (Not that I write a lot of reviews). Something similar happened to me, but it was from an author who wanted me to blurb her story. I read half of it and couldn't continue. I nicely explained the half truth why (not for me), and ending up with a reply that was completely off putting. Basically she told me I was wrong and listed her story's strength. Too bad for her I didn't feel the same way. I ignored the letter. The best thing to do with a bad review, is to contemplate it silently. Glean the good out of it and put it to work with your next writing project. Alex -- I should think that reviews should be a learning experience for authors. The discussions can be kind of fun though. Quanie -- I recall that deal at Goodreads. I should have checked it out. Hilary -- We've got better things to do than try to convince people why they should agree with something we've done. Stina -- If the work doesn't hold up well we should expect bad reviews and learn something from them. You gave good advice Arlee. Everyone has the right to an opinion. If a writer is going to argue with everyone they think is wrong, then they'll never advance professionally. Image is everything. I've learned the hard way not to argue with reviewers. You just have to look at the whole picture and if you have an over-all good rating of all combined reviews a writer should be thankful. Kingsley Amis had it right. He said something along the lines of "A bad review can spoil your breakfast, but you shouldn't allow it to spoil your lunch." Anyone who is upset about a negative review should read the reviews of a bestselling author. People like, say, Stephen King have amassed hundreds of awful reviews, some of them pretty darn nasty. But who cares? You can't please everyone. Recently, an author asked me to beta read her book and I offered some detailed suggestions, but overall really enjoyed it. About a day later she had constructed this insanely long document defending her book against every point I made. I had to ask her why she felt the need to defend her work after asking for suggestions and she said it was because of all the bad reviews she had received on her work in the past on Goodreads and Amazon. She didn't have the opportunity to defend herself before and when she read my suggestions, she kind of took it personal. She apologized, but this is why negative reviews can be detrimental to a writer. Makes me think twice about critiquing someones work unless I really know them. In general, I'd go along with never commenting on reviews. I haven't done so even in cases where I have known that the review had nothing to do with the book, and everything to do with a broader issue with me. Bad reviews like good reviews will happen. We will have to tolerate them or just ignore them. Its not possible for everyone to like our books. Maurice -- If a reviewer wants the author's opinion, he can always ask for it, but I would probably not ask anything of an author in my opinionated review. Steve Tremp-- That's the best way I think. Kelly -- So true. Reviews are just opinions and we know what those are. Sydney -- Kind of defeated the whole purpose of a beta read didn't it? An author should be happy to discuss the possible flaws in a book before it reaches the reviewers and the public. Stu -- Personal attacks are absurd and probably best to ignore unless they could cause harm to your reputation. Then there are legal channels to deal with that. Rachna -- It would be nice if everyone liked our books, but highly unlikely. Thank you for the lovely comment Lee, that's actually something's that's making me will myself to come back. I think it's good to always respond to feedback but not criticism for the sake of it, it should just be ignored. Perhaps all writers should get a shrink, therapist or favorite bartender they can gripe to, because responding to reviews does make you look like an unprofessional hack. Thank you, Lee! This post is so true. As a reviewer, I've had to call it like I see it once or twice, much to the dismay of an author or two. However, I have a responsibility to those who read my reviews, sometimes making decisions based on what I say. When I review a book, my reputation is on the line. If I'm not honest, stating both pros and cons about a book, I'm being deceitful with my own audience. I make every effort to pepper my reviews with positives and negatives, which is why it truly irks me when an author challenges me for something I have written after reading his work. Never engaged. You are so right, it is unprofessional. People have a right to their opinions, even when they are wrong (LOL). I agree with you and other commenters who are saying that authors need to accept reviews as is and not respond defensively. If I read an author's defensive response, I won't buy their work. It's off-putting to me as a reader. I also agree with your point about taking review feedback as an opportunity to improve one's craft and also to see how others perceive what you've put out. Never engage in public - ever. He should've emailed you privately with his response. When you respond in public, you become one of those "authors behaving badly" people. Yeamie -- You leave so many great comments on my site and I feel bad that I don't comment on yours as much. Steven -- Writers groups might be good for that too, if a writer is willing to admit they got a bad review which I can't see why not. MJ--I try to do the same as you say. I don't think I've ever been all negative on a review. I almost always find something good to say about a person's creative attempts. Jagoda -- If a writer has to explain what they've written then I don't think they've written very well. L.Diane --After he found out who I was he did start e-mailing me. Extensively in detail. Eventually I think he either got mad or exasperated that I didn't agree with his views and dismissed me telling me that he never intended to see me again. Okay I suppose under the circumstances, but really I was not trying to rile him, I was only asking questions and explaining my own personal beliefs. In the end none of our exchange had anything to do with the book itself. I think all writers would like to explain themselves and their books to reviewers, but they shouldn't. It's bad form and paints a bad picture of the writer. I've heard many disaster stories about what happened when an author replied back to a negative comment to defend their work and created a war. To me, it sounds like your review was a great one that would definitely help readers to decide if they want to read it. That, after all, should be the goal of a review. If I get a bad review on my debut after it comes out, I'm definitely not going to respond. I'm not even going to respond to positive reviews, unless I can do it personally. What many writers don't understand is that while a negative review can hurt our feelings, it doesn't actually hurt our books. Some people actually read books because of negative reviews and end up loving it. As a reviewer of books, it is my responsibility to review the book with my "open and honest opinion". This is in my disclosure statement each time I review. As someone else said, it is my reputation on the line as a reviewer and if I like a book or don't like a book, I will say so. I feel that if an author does not truly want my opinion of a book, then that opinion should not be asked for. To refute a review in any way is unprofessional on the authors part. I do want to say though, some comments that have been left on authors books have been solely to harm authors. These are not reviews and have no place on Amazon or Goodreads! This is something I have personally gone up against and is not fair to any author. In case anyone is curious, I am referring to a certain Amazon reviewer who has shown up on many authors pages. There is a group that goes out of their way to hurt an author who has a review from her. The things you learn just by a blog post and a review of a book... After you said he commented, I had to go back and click on the link. That was a lovely instructional on What Not To Do as an author. I am sure that the problem is that he feels invested in this story and it is much like a child. Think how defensive parents get when someone critiques their kid. As writers, once we publish we MUST let it go and accept that some people will like it and some won't. Just like everything else in this ole world. I would never argue with a reviewer. Sometimes their critique does point out a spot of weakness. One reviewer gave me a one star because there was too much romance in my book, even though it was listed as a romance. You can't discuss anything with someone like that. Reviews--I have written a few, and must say I've become more analyzing than at the beginning. Not rude or anything, just looking at the basics of good writing. I think authors have to develop tough hearts when it comes to their creations. If you have to explain/defend your story, you probably didn't do a very good job of getting your point across. Probably best to keep your mouth shut and listen/learn. My initial thought was it was okay to respond to a review if there was a misstatement of facts, but it seems like the popular vote is let the critics have their say. I'd see no point in debating the critic's opinion, as they are opinions. There's no winning that discussion. Chrys -- I am one who has purchased books because of negative reviews. Naila -- It's very wrong to review for any reasons other than the merits of the work. That's why readers read reviews. Robin --- And since I was following this guy's progress on his book, I was very aware that he published before he was ready to. He should have waited. Susan GK -- Sometimes it's just a matter of taste! Susan Kane -- If you're going to be in the public arena you have to be prepared to be pelted by rotten tomatoes sometimes. Faraway - That's exactly what I told this author. Larry-- Unless the debate has been set up as such things should be left alone on a review. Traditionally a review is a one sided affair. No writer/artist/creative person can please everyone. I love Salvador Dali but I'm not a big fan of Picasso. I love Steinbeck but I've never enjoyed reading Hemingway. That's just the way it is. Life would be very boring if we all liked the same thing. There would be no diversity. When it comes to a "bad" review, it's just an opinion. And if you intent to put your creative efforts out there, you can expect to have differing opinions. Just remember, like belly buttons, everybody has at least one. And as for responding to them... don't get caught up in a debate. An author should never approach a reader's response with "but you didn't understand." Id the reader didn't understand, that's the fault of the author. Period. Sure, not all readers are as smart as others, but, if an author wants -every- ready to "get it," he needs to write in a manner so that -every- reader will "get it." That is the responsibility of the author, not the reader. So, as an author, the correct response to a reader not getting something I wrote is not to say, "no, wait, you just didn't get it." The correct response is for me to go look at what I wrote and figure out -why-. Aside from that, I hate when people say "should of." You should never "should of" anything. "Should have." People often say writers should toughen up as if artists portraying the silences hidden in prose could actually change and become warriors enlisting their muse before turning stone cold, able to shake criticism off their shoulders like dewdrops pounded into the field by an army regiment practicing maneuvers. I thought I would respond before even going to Amazon. I don't think an author should reply to a review - ever. I don't think any author should respond to any reviews. At all. Even the good ones. I've often heard it said that reviewers just don't like the feeling that authors are looking over their shoulders. They don't want to be careful with what they say. They want to be honest. If that makes sense. I agree with you. I still don't know how to handle a bad review. I've also been very tempted to leave comments as well. But I have to let the readers say what they want about the book. Honestly. I can't force people to like it. That has to come naturally, so even though there are bad reviews out there, I like to take the chance and make the call for myself. Good post, Lee! Bish -- And the review I left was not even bad! Andrew -- I didn't notice the "should of" thing. The guy should have waited to put his book up on Amazon and finished it first so it would have been clearer. Desert -- That's a poetic way of putting it. Wendy -- Not unless specifically asked to do so. And reviewers normally don't ask. Lynda -- I always hope the creator of whatever I reviewed will read my review, but I don't want that person challenging my review in public. Mel - I guess if all the reviews are bad then that's a definite message, but if it's a mix then we're just dealing with a public with different tastes. Read the reviews and hopefully learn something from them. Well this writer clearly has some priorities to figure out. When you're trying to get reviews and even do a free promotion, the last thing you should do is berate reviewers. That only ensures no repeat clients which is essential to authors who want to make this into a career or write multiple books. My response for any feedback is "thanks for the feedback". I believe a reader is entitled to their opinion, as long as it is not deliberately cruel or berating. The author needs to determine if he did the job of clearly telling the story, and if the reader didn't "get it" then they didn't get it. Not every book will appeal to every reader. As for me, I learn from every piece of feedback, even if I don't like it. But I'd never respond publicly like that on a review. I repeat; readers are entitled to their opinion. Hey Lee, I think it would be best to not respond to any review, good or bad. If I ever realize the dream of publishing a book, that's going to be my policy! It's true, not everyone will love, or even like what we write. If people 'don't get it', then let them discuss it among themselves. I heard someone say once that we should write for ourselves first, and not worry too much about catering to a particular audience. Hey again, just had to add that I agree with Andrew about the 'should of' issue. Bad grammar and spelling will put me off a story immediately, unless of course it's something written by my eight year old grandson. Sheena-kay-- This author has some things to learn about marketing and public relations if he plans to do anymore books. Donna -- When I look at the Amazon entries with nary a review I agree that any feedback is a sign that something is happening with a book. Eve - We need to understand who the reviewers are and their intent and then learn from the reviews based on that information. Some reviews don't really mean all that much. I agree with everything here. Authors should NEVER respond to reviews on a public forum like Amazon or Goodreads, not even to say thanks for the review. We have to let reviewers have their space without feeling like the author is going to jump in and put in his two cents. I like your comment about how if he comments on every sort of criticism he's going to have a lot of work ahead of him. Haha! So true, and we have enough to do why but that burden on ourselves? Karen -- A thank you might be tempting at times, but I think it could also look suspicious. Your advice to him regarding the wisdom of him leaving a response was very wise. I don't think there's any way for the author to come out looking good in that situation. One of the first bits of advice I got right before my first book was published was that author's should NOT respond to bad reviews, and I'm glad I got it, because I understand the reflex to want to snap back. On an entirely other note 4 stars is a GREAT rating. It's crazy to me that some authors get offended by anything less than 5. I even cherish some of my 3 star reviews because of insightrul things the reviewer said. I agree that the author should not respond. It will only make matters worse. Nicki & Julie-- Thanks for the comments. It's probably quite tempting to respond to some reviews, but it probably makes a writer look small. What truly busy writer would have the time to respond to reviews? I tried leaving a comment through my smartphone, but it never made it through. Great advice on not engaging bad reviews. You definitely come off as unprofessional, defensive, and insecure. Easier said than done because if you are pouring your heart and passion into your piece, the last thing you want is someone to trash it. If it is constructive and helps you improve as a writer, it really is a good thing and you can't take it too personal. If it is a baseless attack, you need to just ignore it as nothing good will come out of arguing with a hater. Buck - And in my case it was kind of funny because the review I left was really quite positive. What would the author have done with a truly bad review that trashed his work? Hopefully now he'll be ready for that if he gets anymore reviews.